Last time we looked at the THINK aspect of starting exercise. If you haven’t read it, I strongly suggest you start there first, as it will build the foundational mindset you need to make the DO part more successful. That’s what we’ll look at now. After I wrote Part 1, I decided to divide the HOW TO DO into TWO parts. Do you really want to read this now? When we buy electrical appliances, instructions often come in a Quickstart form as well as a Detailed Guide. For those who want to get started straight away without wasting time, the Quick Start is the best way to learn how to press play and stop. Likewise, our Quickstart will get you quickly into the feel of exercise and fat burning. Now, you might like to read your Blu-ray manual cover to cover before even pressing the on switch, but for exercise I recommend doing the Quickstart for two weeks first. It’s a good primer to help you warm up, especially if you haven’t been active for a while, and start an exercise habit. You’ll be raring to go for the Detailed Guide once you realize you can do it! Just like you need know if your Blu-ray player can even use your power supply, you have to make sure you’re safe to exercise, particularly if you haven’t done it for a long time. Read the following 7 questions, taken from the PAR-Q (Physical Activity Readiness Questionnaire). If you answer YES to any of these questions, check with your doctor first before you start an exercise program. We need energy, and we get it through food in the form of calories. Weight gain, loss or maintenance comes from the balance between calories we take in and calories we use. For now, just accept this basic assumption. In future we’ll discuss why this isn’t so straightforward. 1. 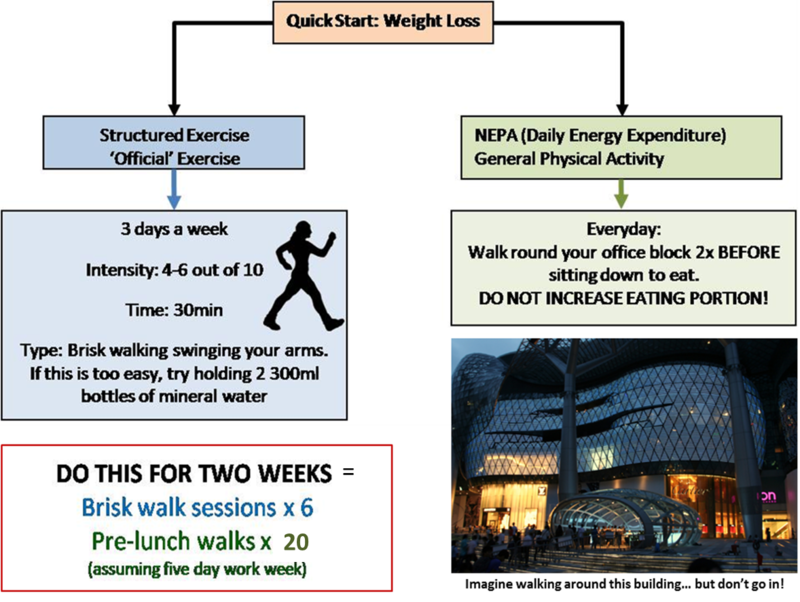 Exercise – planned and structured physical activity, what most people think about as “exercise”. 2. Non-Exercise Physical Activity (NEPA) – incidental activities we do such as walking, house chores, grocery shopping, climbing stairs. After a 5 min warmup, ask yourself: On a scale of 0 – 10, where 0 = resting in bed or lazing on the couch, and 10 = about to drop from exhaustion anytime, how hard am I working? If 0 = 0%, 4 = 40% and so on, what percentage of my max effort am I using? So, let’s put it together shall we? Here is your QUICKSTART program. That’s it for a start! By the time two weeks have passed, you would have done a total of six brisk walking sessions, and circled your office building 20 times!